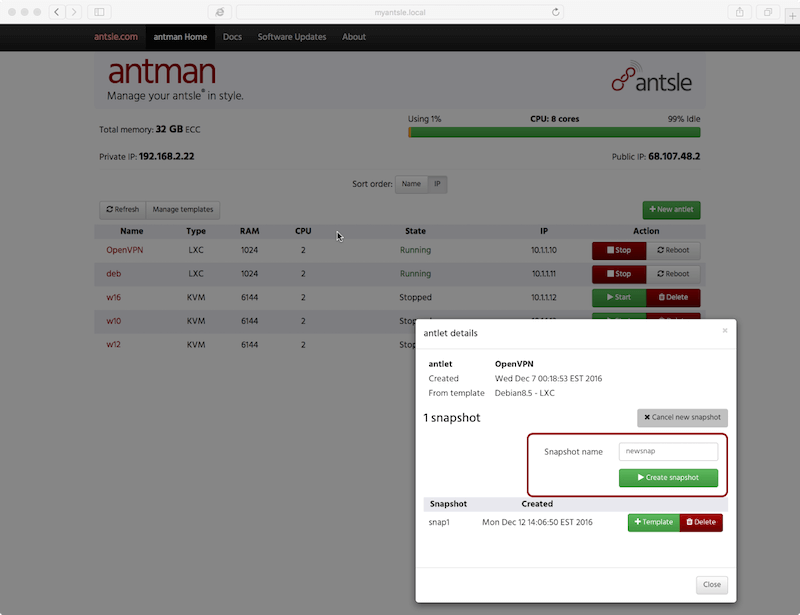 antman 0.4.0 - antsle - The Private Cloud Server, Built for Developers. Snapshots are here! Right from antman, you can take live snapshots of any of your antlets, as easy as 1-2-3. Our sleek looking, fresh and modern GUI allows you to create, manage and delete them. Just click on the name of your antlet and you'll see an 'antlet detail' window, including the snapshot manager. So far so good. Now I see you asking "Bernie, I've seen snapshotting before. Why are you trying to tell me it's the best snapshotting I've ever seen?" Well, ever tried to take a snapshot on Amazon EC2? Well, it literally takes ages. And your snapshots take up a lot storage space on AWS. With antsle, taking a snapshot is close to instantaneous! It's like a point in time that's being entered into our internal bookkeeping. Only if and when changes are made to the running antlet - and thus the snapshot begins to differ from its parent antlet - space will gradually be used. Those of you familiar with git will see some similarities. Yes, git revolutionized the world of version control by enabling low-overhead branching. The same way, antsle is offering low-overhead and blazing-fast snapshots by using ZFS as the underlying technology. Does all this only work for KVM-based VMs? We've got good news: It works the same easy way for KVM antlets as it does for LXC antlets. Again, antsle is the only turnkey-solution in the marketplace that lets you easily manage both VM & container VPS in the same tool. With antman 0.3.2, we introduced the capability to download from a growing list of antsle-provided templates. Now, we’ve gone a step further. We empower you to lift up any snapshot you created to template status. Just an example: You can create an antlet from a debian template, then install apache, PHP, mysql, then take a snapshot of that “enriched” debian (a.k.a. LAMP) and make a template of it. And - voilá - you have your very own template that you can now use to create lots of antlets from. Does all this only work for KVM-based VMs? We’ve got good news: It works the same easy way, for KVM antlets as well as for LXC antlets. Again, antsle is the only turnkey-solution in the marketplace that lets you easily manage both VM- and container-based VPS in the same tool. The most prominent change is the live gauge of CPU utilization. We’ve also modernized the buttons, given you a modern way of showing notifications in the upper right-hand side of the browser windows, given you an opportunity to launch the templates manager from the main page, and much more. Check it out, you’ll like it! Forgot when you created an antlet? What template did you use to create a previous antlet? You can now find that information on the antlet details page when you click on an antlet's name.